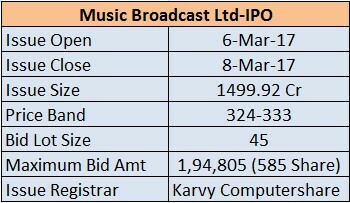 IPO of Music Broadcast Ltd, operating Radio City FM Channels opens from 06 Mar. 2017 to 08 Mar. 2017. The price band of Issue is Rs. 324 to Rs. 333. 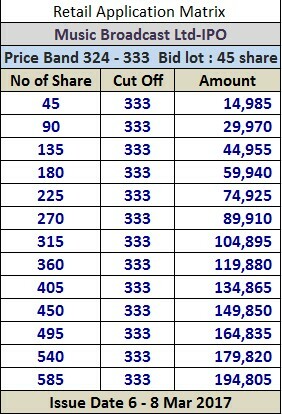 The fresh issue has an offer for sale of 2,658,518 shares. Music Broadcast Ltd is promoted by Jagran group which is a leading media & communication group in India. The management team has several years of experience in media industry and the board comprises of eminent professionals from the radio and media industry. Music Broadcast Ltd operates 29 Radio Stations and 40 web radio stations through Planetradiocity.com in eight languages. It is present in 12 out of the top 15 cities in India by population with a reach to 50 million plus listeners.